I love camping but I really am not a fan of those early mornings. I always wake with the sunrise and dawn chorus and when my children were younger they'd be up too. I remember thinking to myself when my children were toddlers that surely you must be able to buy black out blinds or something similar for tents to block out the sunlight and squeeze in an extra few hours sleep but I could never find anything that did this on the market. Fast forward a few years and now the new thing seems to be for tents to have blackout bedrooms built in. Genius idea! 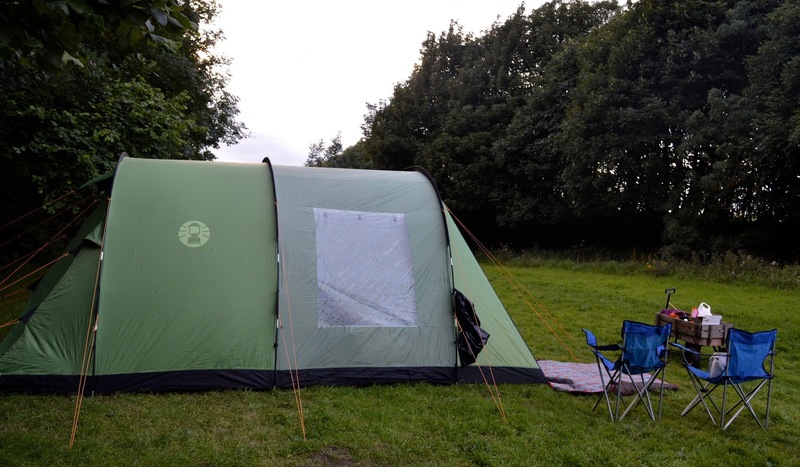 We were sent to new Coleman Cabral 5 to review during our recent camping trip to Birkheads Wild in Gateshead. 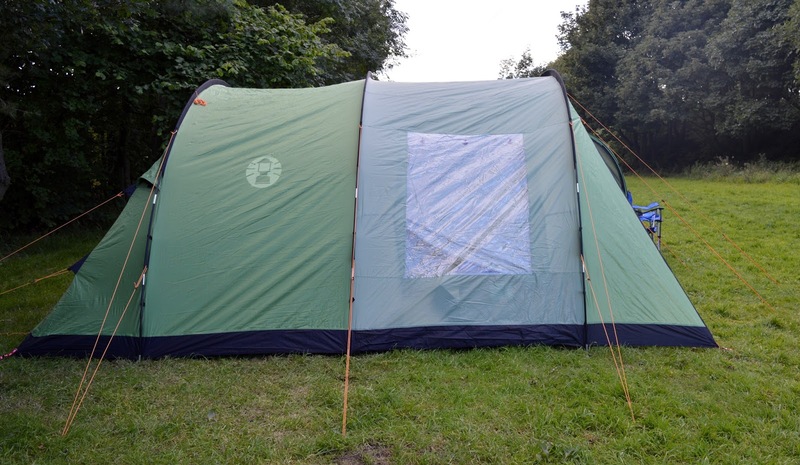 The tent's RRP is £429.99 but I've already found it for sale on Amazon for around £300. The tent is available in a smaller size (Cabral 4) or larger (Cabral 6) but as a family of 5, I think the Cabral 5 was perfect for us for a shorter camping trip. If I was staying any longer than a few days, I'd probably go for the Cabral 6. 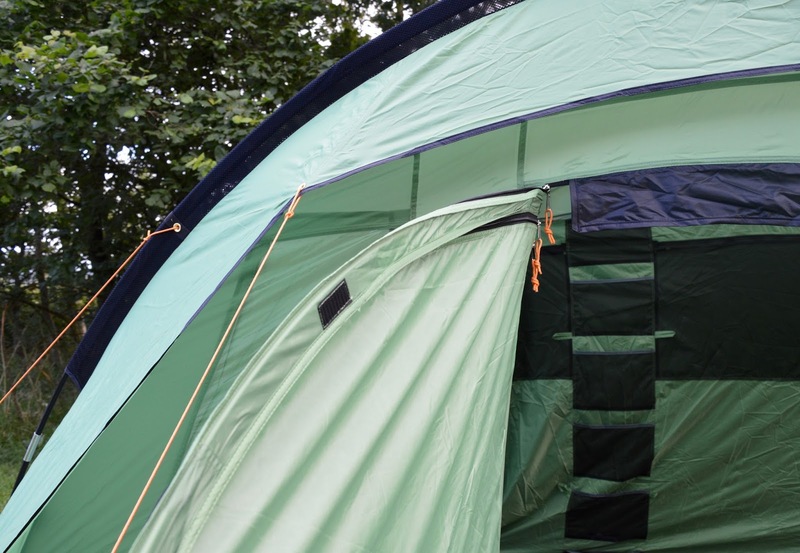 We are seasoned campers but the Cabral 5 is super easy to put up, even for beginners. Simply unpack and thread the three fibreglass poles through the designated loops then peg in place. It honestly couldn't be easier. I loved that the inner tent is already clipped in place so you don't need to waste time setting that up separately. The ground sheet is sewn in (which means less wind, rain and bugs) and I also like that the guy lines are bright orange so nice and easy for the kids to see. Pegs, spare tubing, a puncture repair kit and a carry bag are all included. The tent weighs about 14kg and will probably need two adults to carry. We used a trolley which I'd recommend if you're pitching any great distance from your car. It took 2 adults around 25 minutes to pitch during our first attempt and around the length of time to take down and pack away. My first impression was that the Cabral 5 felt a lot smaller than our Skandika Kairo Six Man Tent however, it's also worth noting that the Cabral 5 weighs half as much as the Skandika Kairo. The living space is smaller in the Cabral 5 but the bedrooms are very roomy. There are two bedrooms that will sleep up to 5 people (you could maybe squeeze another child in if you don't use airbeds) and bedrooms will easily hold a double air bed and have enough space either side. We used our Coleman maxi double air bed in the main room and there was plenty of space. Blackout bedrooms - do they work? It's really difficult trying to capture just how dark the bedrooms are but if you watch this video below, it will give you an idea. The bedrooms are an inner tent already hooked into the outer tent and both bedrooms use the same technology. When we went to bed at around 10:30pm, the bedrooms were pitch black - much darker than my own bedroom at home. There was a little bit of light sneaking through where the inner tent joined the main tent but that isn't too much to worry about. On waking, it still did feel dark but it wasn't pitch black. I'm not sure if this is due to my eyes adjusting maybe though as when I opened the bedroom door into the main living area there was a huge difference and without the blackout technology it was very noticeably lighter. I really wish this black out technology had been around when my children were younger. They pretty much go to sleep at the same time as us on camping trips now but a few years ago they would have moaned that it was too light and they couldn't get to sleep. For us, I know the technology worked as Steve and I slept in until 8:30am and the kids 9am (and only because I woke them). 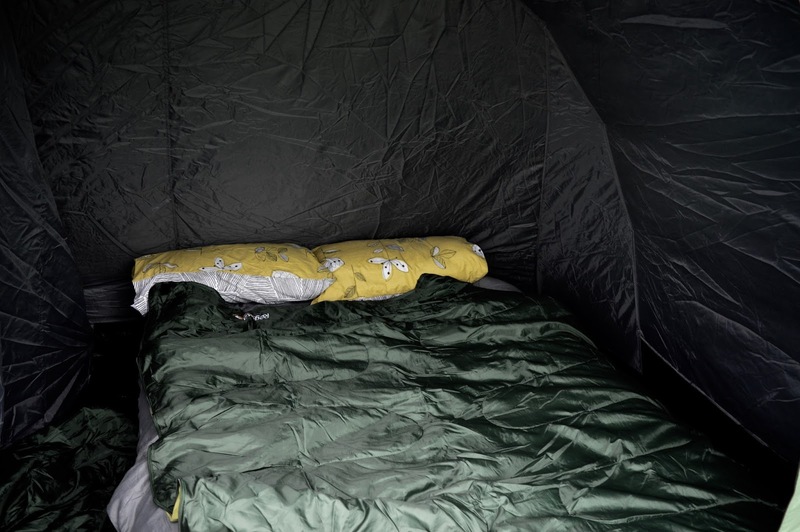 This has never happened when we've stayed in a 'normal' tent before and I can confidently say that black out bedrooms will definitely help you to sleep for longer. Now....if Colemans can invent a sound proof tent next that would be fantastic. Until then, I guess ear plugs will have to do. 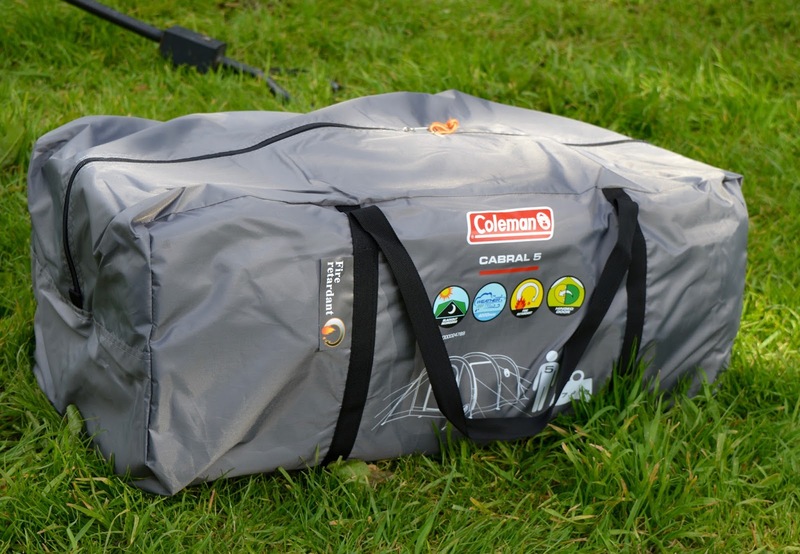 The Coleman Cabral 5 has a hydrostatic head of 4000mm which means that a 4m column of water would need to be placed on the fabric before any would soak through. 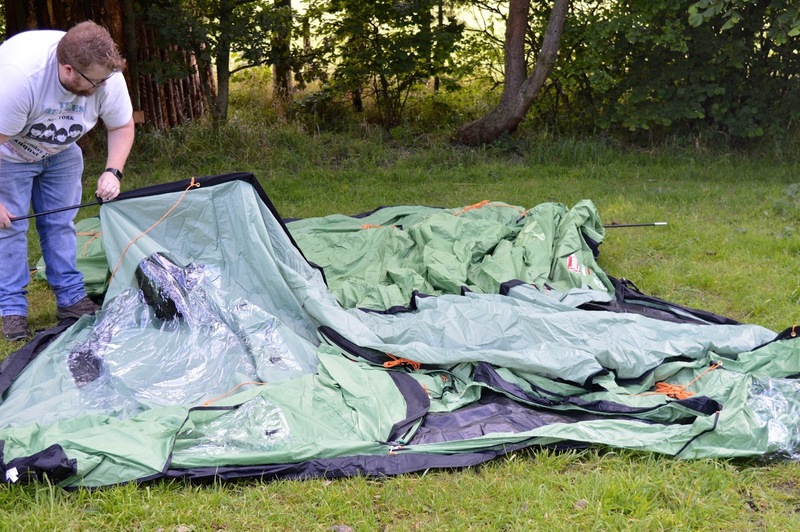 Now I don't think we're ever going to experience anything like that to test the tent to it's limit and I'm confident it could withstand any amount of UK rain. The ministry of defence classifies something as waterproof when it is 800mm+ and the Cabral 5 offers 5 times this protection. The fabric is also fire retardant which offers extra peace of mind. 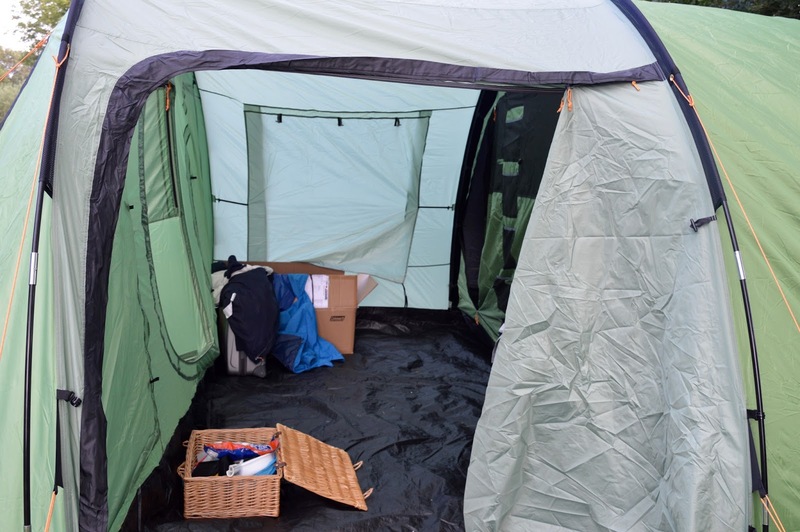 You can comfortably stand up in this tent (I could never go back to a tent you can't stand up in) and there are two doorways - one at the side and one at the front. The front door is very clever as you can set it up as a hinged door which holds in place with velcro. This is nice and easy if you have children who need to be in and out. The hinged door does work nicely most of the time but when it's windy it can blow open (especially if the kids have not stuck the velcro down properly). You can use the door as a regular tent door too which I'd recommend if you're going out for the day or when you're going to sleep. There are a few little details I liked about the tent such as hooks to hang your lanterns and a built in organiser between the bedrooms. 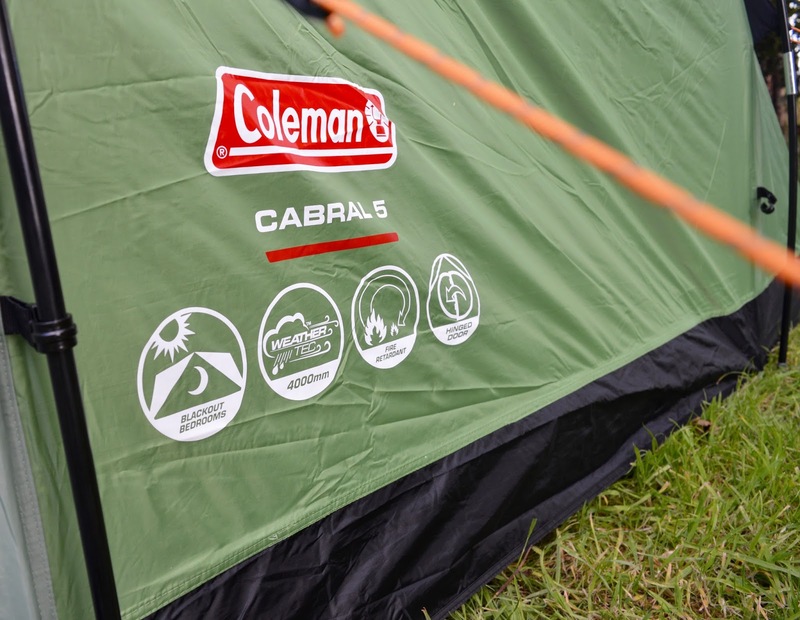 Overall, I loved the Coleman Cabral 5 and it perfectly suited us for a short break. I will use this tent every time we are going away for 1-2 nights. 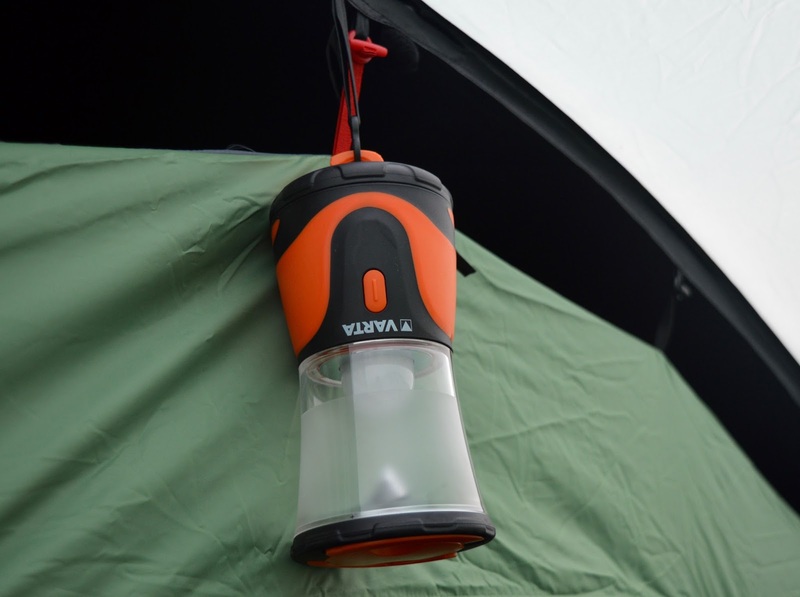 I loved how light the tent was, the black out technology, how robust the tent felt and how easy it was to put up. We are looking at going camping for 7 nights in Cornwall next year and as much as I love the Coleman Cabral 5 I don't think the living space is large enough for a family of 5 for a longer break. We could fit three chairs, our cooking equipment and luggage in at a squeeze and would need more room for a longer trip. We love the features of the Coleman Cabral 5 so much that I think we'll probably buy the Coleman Cabral 6 for our big trip next year.